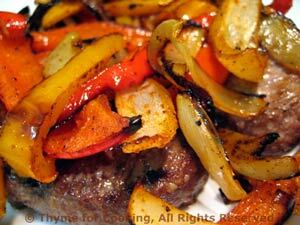 Grilled Burgers, Onions, Peppers, easy for summer, Thyme for Cooking. Add paprika and garlic powder and sauté 1 minute stirring constantly. OR sauté in skillet for the same amount of time, until done to your liking. Slice peppers (cut in half from bottom toward stem, discard seed and core) into large slices - 1/2 inch wide (1.25cm). Slice onion into 1/2" (1.25 cm) thick slices.